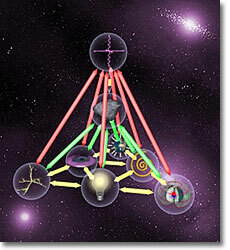 The origin of any discernible or measurable energy seems to be space energy, which is at the top of the energy pyramid. Space energy interacting with matter (symbol in the center of the pyramid) gives rise to other kinds of energy - such as magnetism, electrostatics, gravitation and two relatively unknown spectra of energy: electrogravitation and gravomagnetism. The Aquapol system uses the energy spectrum of gravomagnetism, which was explored by W. Mohorn.